In this paper, we study the design of a typed functional semantics for B. Our aim is to reuse the well known logical frameworks based on higher order logic, e.g., Isabelle, Coq and PVS as proving environments for B. We consider type synthesis for B and study a semantics and some of its composition mechanisms by translation to PVS. B. Barras, S. Boutin, C. Cornes, J. Courant, J.C. Filliatre, E. Giménez, H. Herbelin, G. Huet, C. Muńoz, C. Murthy, C. Parent, C. Paulin, A. Saïbi, and B. Werner. The Coq Proof Assistant Reference Manual — Version V6.1. Technical Report 0203, INRIA, August 1997. http://coq.inria.fr. S. Crow, S. Owre, J. Rushby, N. Shankar, and S. Mandayam. A Tutorial Introduction to PVS. In Workshop on Industrial-Strength Formal Specification Techniques, Boca Raton, http://www.csl.sri.com/pvs, April 1995. P. Cousot. Abstract interpretation: Achievements and perspectives. 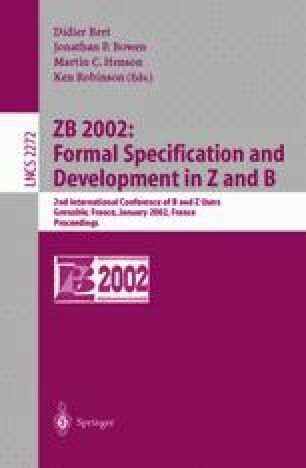 In Proceedings of the SSGRR 2000 Computer & eBusiness International Conference, Compact disk paper 224 and electronic proceedings http://www.ssgrr.it/en/ssgrr2000/proceedings.htm, L’’Aquila, Italy, July 31-August 6 2000. Scuola Superiore G. Reiss Romoli. M.J.C. Gordon and T.F. Melham. Introduction to HOL. http://www.cl.cam.ac.uk/Research/HVG/HOL. Cambridge University Press, 1994. G Mariano. The Bcaml project. Technical report, INRETS, http://www3.inrets.fr/Public/ESTAS/Mariano.Georges, 2001.